Johnny Taylor was 25 when he was selected for Australia’s first post war Test in December of 1920. After that he played in all but one of the next 19 before being discarded for the fourth Test in 1926, never to return. He was therefore virtually ever present in the Test team for half a decade. Despite that Taylor’s name is not one that has left too much of an impression on the game’s history. He had a good series in 1924/25, averaging more than fifty and recording his only Test century, but that apart his record is, judged purely on his statistics, somewhat underwhelming. In an era where, in Australia at least, timeless Tests were the norm and many runs were accumulated Taylor owes much of his reputation to two factors. Of no great relevance at the time but more important as time has passed was Taylor being the batting hero of a young Donald Bradman who, as a twelve year old, saw Taylor bat in his first series. More important back in the early 1920s was the way Taylor batted. In his playing days comparisons to the fondly remembered Victor Trumper were frequent, and understandably attracted many to his cause. Other pluses where Taylor was concerned were his peerless fielding skills and, whilst he might not have made too many runs, he had the useful habit of generally making those that he did at important times. He was also by all accounts a genuine, modest and extremely likeable man. Perhaps, the reader is left to conclude, had he had a bit of ‘mongrel’ in him Taylor might have improved those numbers considerably. Author Max Bonnell, as he always does, has thoroughly researched Taylor’s life and times. It is an era with which he is more than familiar, having already written a full biography of Herb Collins, Taylor’s teammate in most of his Tests and First Class matches and his skipper in 1924/25. Chronicling Taylor’s early life proved difficult due to a lack of source material, although the ability to speak to the widow of Taylor’s only son doubtless assisted Bonnell greatly. With much press interest Taylor’s cricket career is covered fully, and other aspects of his life dealt with as well. Bonnell has found out about Taylor’s education, his role in the Great War and also his life outside the game as his ambition to qualify and practice as a dentist eventually brought his sporting career to a premature end. Essentially a double international Bonnell also provides a chapter dealing with Taylor’s success on the rugby field. Having very recently read Bonnell’s other new book, Ebley Street Boys*, I am getting used to the style of his writing. He doesn’t waste words, but at the same time there is plenty of detail in the narrative and a passion for the era and subject come shining through. I am certainly looking forward to reading another Bonnell book, Currency Lads, which many years after I originally acquired it has finally been placed at the top of the pending pile. As is his wont Bonnell has self-published Boyhood Hero and, curiously, has done so in an A4 sized format which makes the finished article, consisting as it does of such a modest number of pages, more closely resemble a brochure than a book. Storage problems for the dedicated bibliophile apart however the result is a thoroughly satisfying read with an excellent selection of well reproduced photographs and a statistical appendix that covers everything a reader could reasonably require. 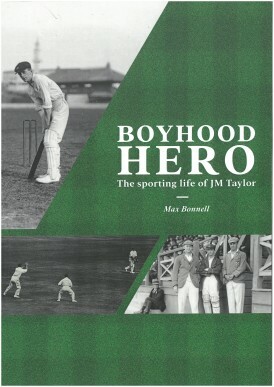 Boyhood Hero is recommended reading for anyone with an interest in Australian cricket in the 1920s. *This is a link to my review – you can also read what the Mac thought here. Thanks very much for noticing this little effort. The proceeds of any sales go to the Sydney University Cricket Club, for which Taylor played. I’ll be interested to see what you make of Currency Lads, which one reviewer described as harder to get through than a Fred Spofforth opening spell.